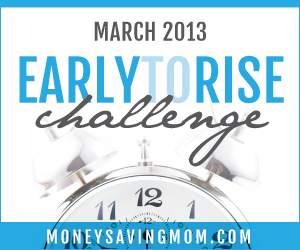 This is Day 28 of the Money Saving Mom Early to Rise Challenge! Today's passage covered praying. I am so glad the author included this passage in his book. I think prayer is such a necessary thing and there are so many (I'm mainly talking about Christians here) who don't take the time to do it often enough. I'm one of them. My prayer life is something I struggle with doing consistently. Most of the time I forget to do it at all. Bible reading/study is a bit more consistent, but not by much. And then there are things like scripture memorization that I know I should be doing, but most of the time just plain old don't. Blah. Prayer is something I'd like to incorporate into my morning routine along with Bible reading/study. Does anyone have good resources on becoming a prayer warrior? I feel like I don't know where to even start to make prayer a regular thing in my life. Has prayer always been a consistent thing in your walk with Christ? Or have you been more like me and not even known where to start? Today's action tip is to start thinking about what I'll do to celebrate my ETR victory! This is kind of fun, but I'm having trouble thinking of something fun. I would like whatever I do to coincide with my new habit of getting up early, either by making it easier, more motivating or more fun when I do it. Usually I would reward myself with something edible, so all I've thought of so far is to go by myself a new kind of coffee. Maybe I'll celebrate by making Pioneer Woman's Iced Coffee recipe, you know since we're headed into spring/summer around here soon (hopefully after this last winter blast gets through with us). Anyway, if you have any other ideas, let me know! Tomorrow I'll be posting what I hope to incorporate in my morning routine after this challenge is over. On to new goals and challenges! Thanks for your cute blog!